This…this is the face of joy, contentment and gratitude. My journey started back in February when I found out that I had to have a tumor removed from my head. They failed to get a good sample in the biopsy, so until April when it was removed, we had no idea if I had cancer or not. To not know, but think you might have cancer, can really change the way you look at your life. It can completely change you and hopefully your circumstances if done right. Praise be to Jesus, there was no cancer! While we were waiting for the surgery, I decided to go with Heroes on the Water for an event at Robinson Preserve. 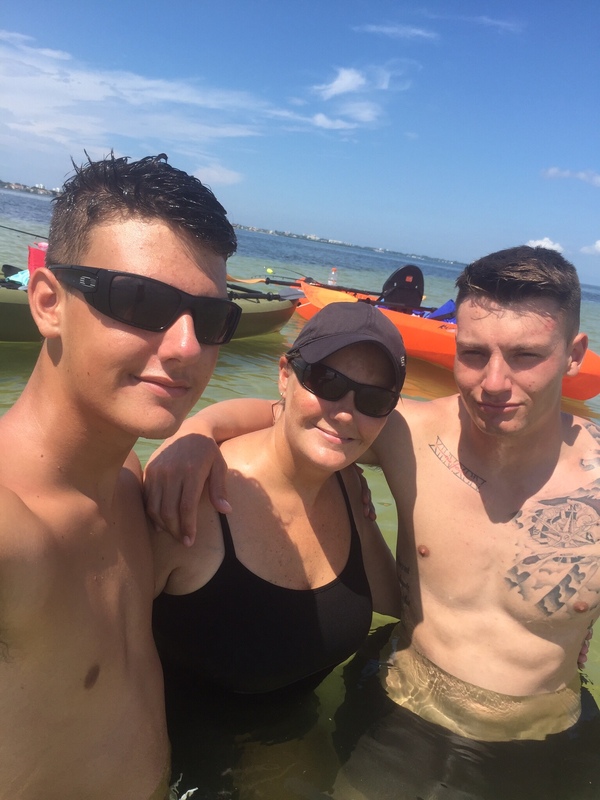 They take Veterans out on kayaks to fish with their families for no charge…it was amazing!! Though I only caught one fish, it was enough to remind me of the great love I had for fishing as a child.I was in a tandem with a great guide, he paddled the entire time, which is great, because I’ve never been in a kayak before! 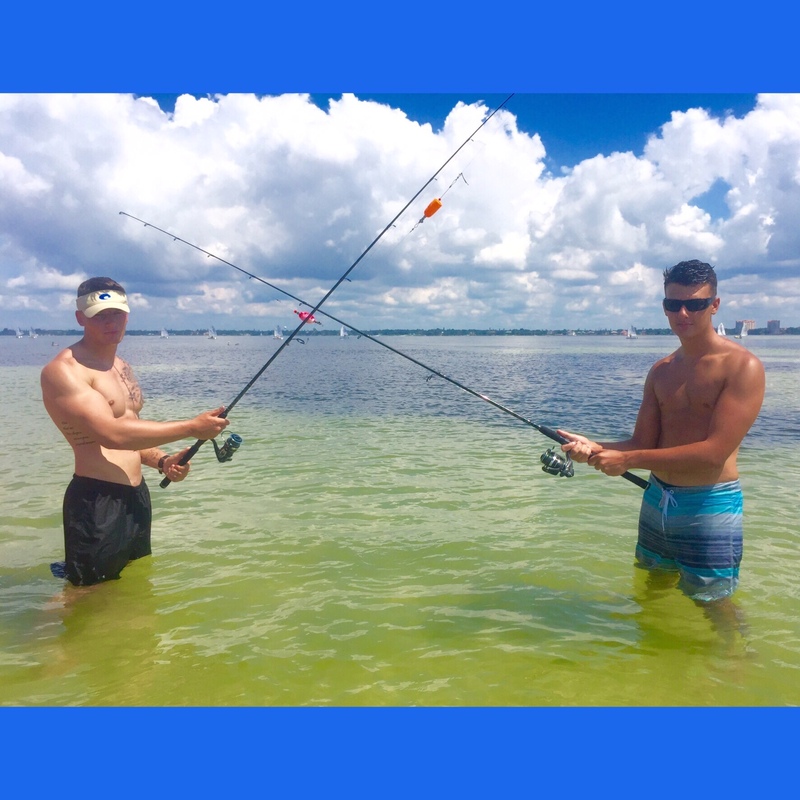 Bronson, my 15 yr old and I rented kayaks from Economy Tackle a couple of times and I heard about a fishing tournament sponsored by the Coastal Conservation Association of Florida – CCAFL, it was called the CCA Florida Star tournament. The tournament was for 108 days, from Memorial Day to Labor Day, all Summer long which was perfect for me, since I still wasn’t working. I had walked away from a position with US Senior Vets that I loved! I’ve never had that much passion for a job, but there were major stresses that took a toll on my health, so I had to step down. Bronson was out of school for the Summer and I feared he would spend the entire Summer on his iPad, so I thought this would be the perfect way to get him out of the house. After having a tumor, not sure if I had cancer or not, getting ill after the surgery, having suppressed autoimmune disease symptoms attack me and keep me in bed for a few weeks. 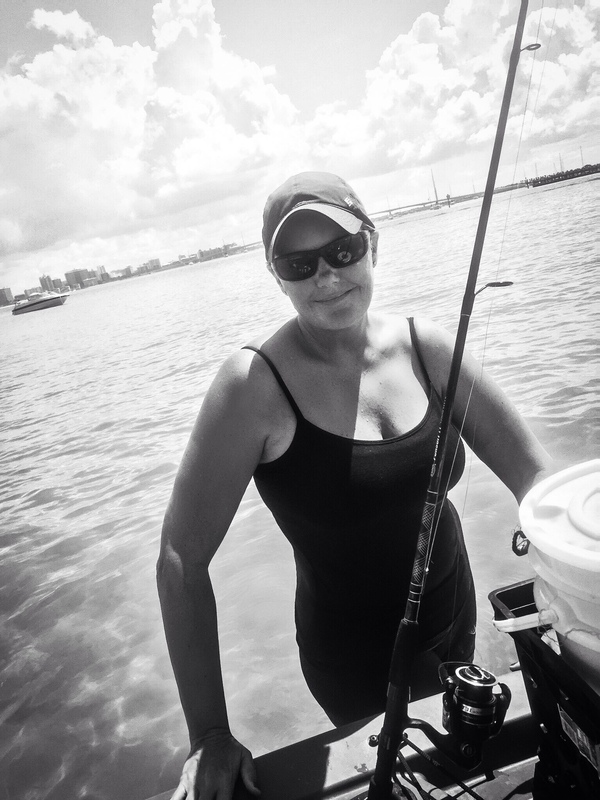 I wanted out of the house and my renewed love for fishing was the way we would start to change our lives! 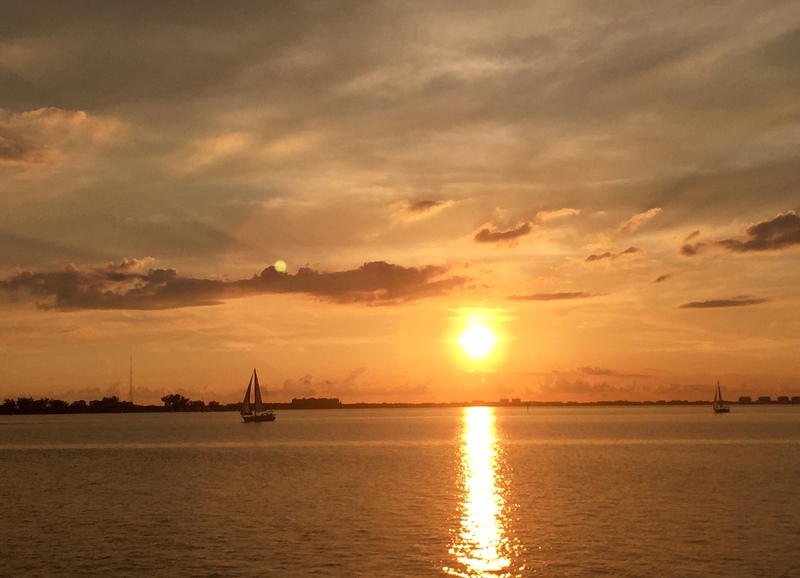 I’ve wanted to move out of Florida since I was about 15, I’ve hated the beach, the gulf…everything about Florida, but all of that was about to change. I would learn that God could change a heart and that I would grow to love this beautiful state and how fortunate I have been all of these years to live where I do! We started fishing in the kayaks we rented, we continually would ask the guys at Economy Tackle for fishing advice on lures, where to fish, best hooks…okay, really everything, because we had no clue! 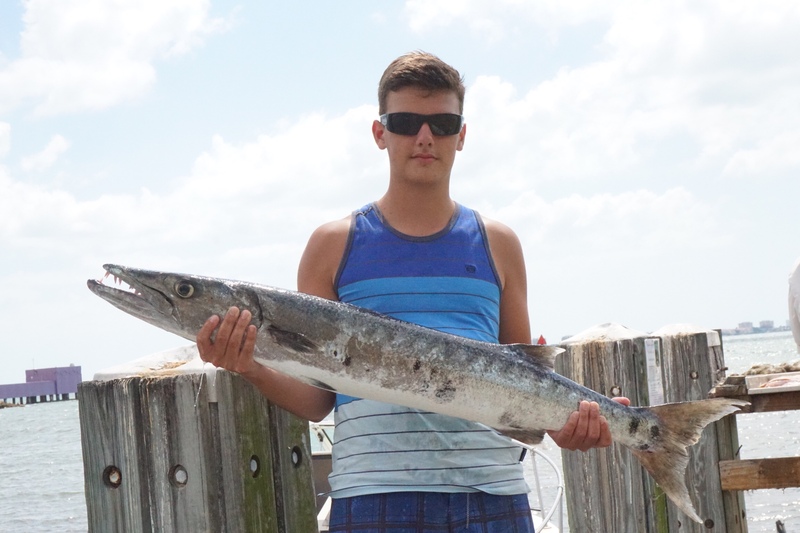 See, this tournament was an inshore fishing tournament, to catch a tagged redfish would bring the biggest prizes, but there were other fish in the Open category that had great prizes too. 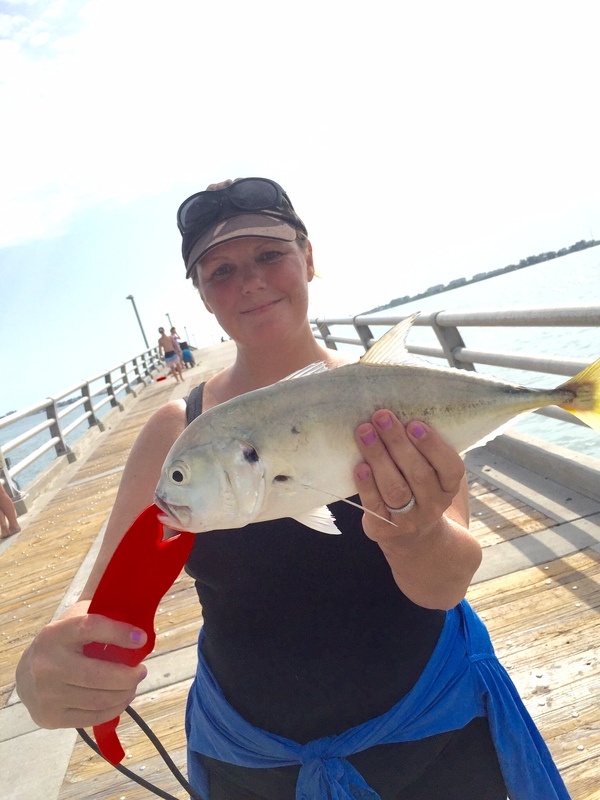 So, we were hunting, red fish, cobia, sheepshead, spotted sea trout and snook. Not a problem, except that neither of us had ever caught any of the fish needed for the tournament and we didn’t know how or where to find them! I fished a lot growing up until I was maybe 15, then maybe 5 times in the last 30 years and my sweet grandfather always took care of knotted lines or putting hooks and weights on the line, so I really didn’t know anything! I did watch him, so I think it may have helped a little…but I knew how to fish, he taught me that and I think you never lose that! We also were fishing out of kayaks which I will tell you, isn’t very easy and to make matters worse, the first time we rented one, was the first time I’ve ever paddled a kayak on my own and only the 2nd time I had been in one! So we were learning everything as we went, maybe not the smartest way to do it, but heck, we had 108 days…anyone could learn anything in 108 days! I found a friend on Facebook that was selling like brand new Kayaks at a steal, so we bought kayaks of our own. We had only invested $60 for me to enter the tournament, my son since he was under 17, it was only $15 for him to enter. The Youth division was for scholarships, there were 2- $25,000 scholarships and 10-$5,000 available. 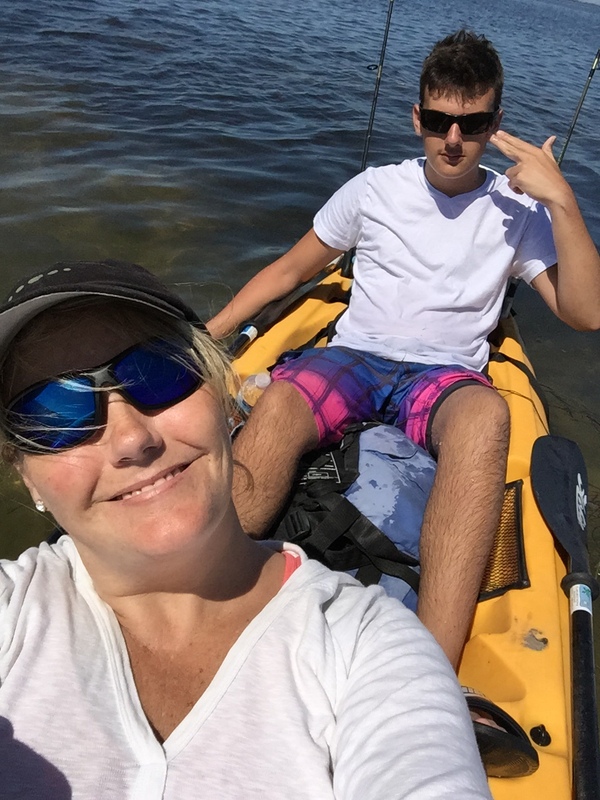 It was enough of a motivator for him to get out and fish and I wanted to win a boat so we would continue to fish and because I personally was having a problem fishing in the kayak that I wasn’t sharing with anyone. I had developed a fear of sharks & what I can’t see in the water under me, when I was probably 4 or 5 years old. I never outgrew it, I fought it and tried scuba diving with them, no problem, but now if they can get under me or if I don’t know they are there…I get very anxious and I have panic attacks. However, I haven’t really told anyone, because I’ve never really had a fear of anything, no fear at all, until I came back from the Army. I wasn’t in battle, it wasn’t that, but something in me changed while I was in and now I get panic attacks. Anyway, the only person who was seeing me freak out was my son, but he just thought I was scared of sharks or that I was just being a girl! 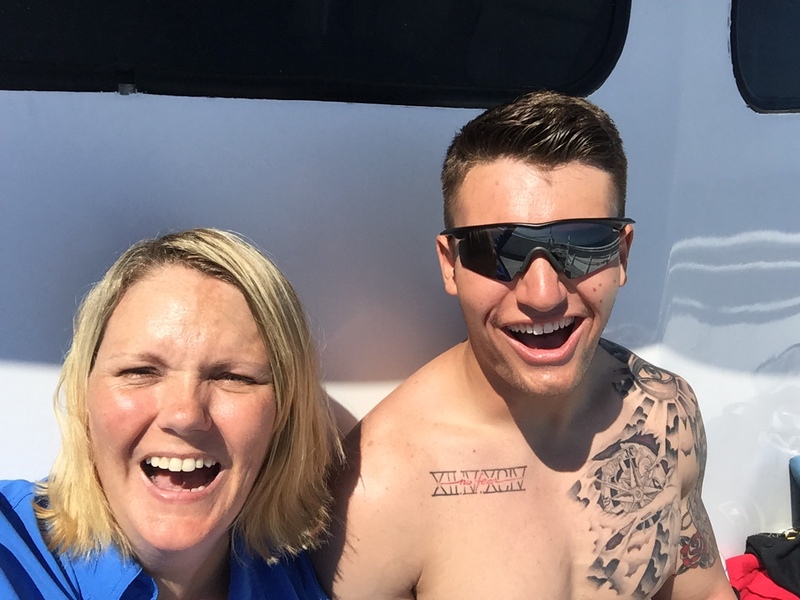 Bronson had his 15th birthday celebration on the boat of my friends Tony & Shelley Ballam. 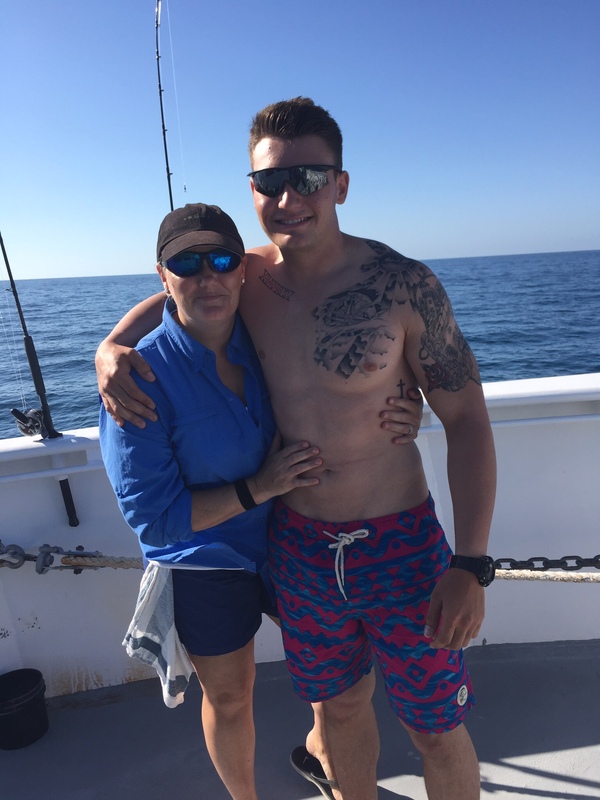 He offered to take us out, they knew we were wanting to really do some deep sea fishing, since the closest we had been was the Flying Fish twice in the last 2 weeks, catching grey snapper and grunt.My older son was home on leave from Ft Bragg, so he went on the Flying fish with me too. It was more like a video game, not much to it.We would bring up 2 to 3 fish at a time and we would have a contest to see who would catch the most, so the Flying Fish is not really the type of fishing we wanted to do. So, going out that morning with Tony & Shelley the weather was rough, most boats never even made it out of the 10th street boat ramp, but we were with a real pro! Bronson caught a 4 ft barracuda, I caught a 15lb Jack Crevalle and we caught our limit of Red Grouper. It was a blast, we had the best time and they were amazing hosts! So grateful for that trip! Tony is a great captain!! 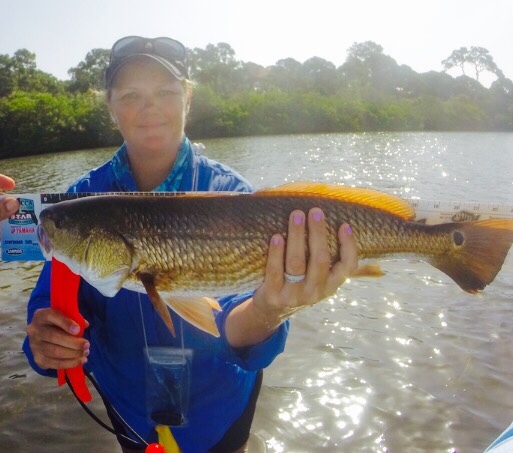 So, we fish our little hearts out for a month between the kayaks and the local pier…we bother Lt. Dan from Economy Tackle so much about these redfish, that I have still never seen after fishing for a month in the tournament, that he offers to take us wading in Lemon Bay. He jokes about it being a shark breeding area, but says the water is clear you can see sharks coming and says he and his wife, Toni will meet us down south on Sunday. I research every possible thing about what attracts sharks,how many attacks and deaths from people wade fishing and if wading gear is a deterrent . 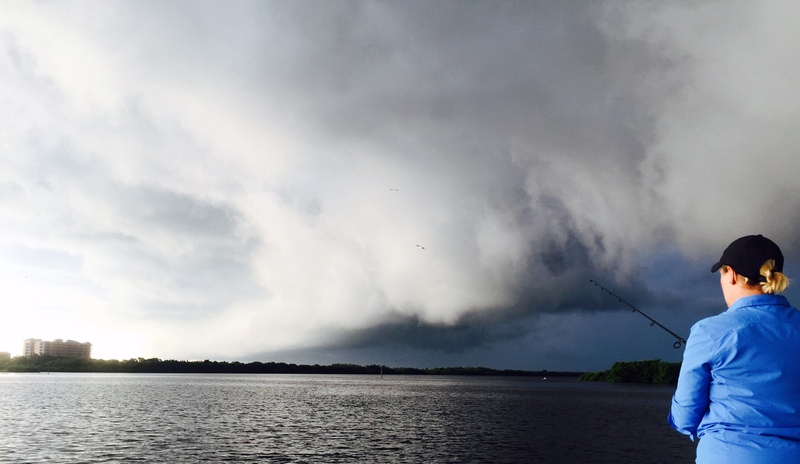 We show up on Sunday and it’s overcast, and the water is murky…he says if something bumps you, hit it with your pole! 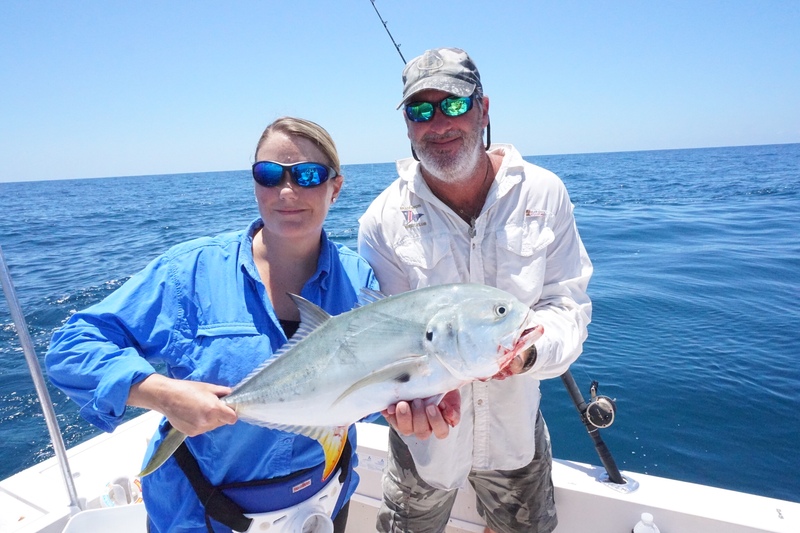 Panic starts to take over my body as we are wading to almost hip high, he’s concerned that we can’t see anything if it was coming for us…then I catch my firsts red fish and she is beautiful and all my fear is gone!! I let her go and then catch my first sheepshead. 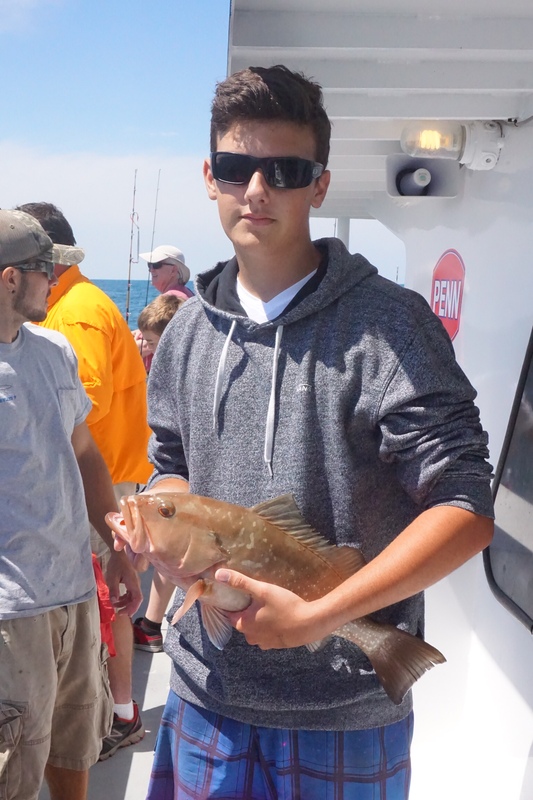 It turned out to be a great day, but the sheepshead was bleeding a bit and I could hear the panic in his voice to send it on it’s way before we called in the sharks. 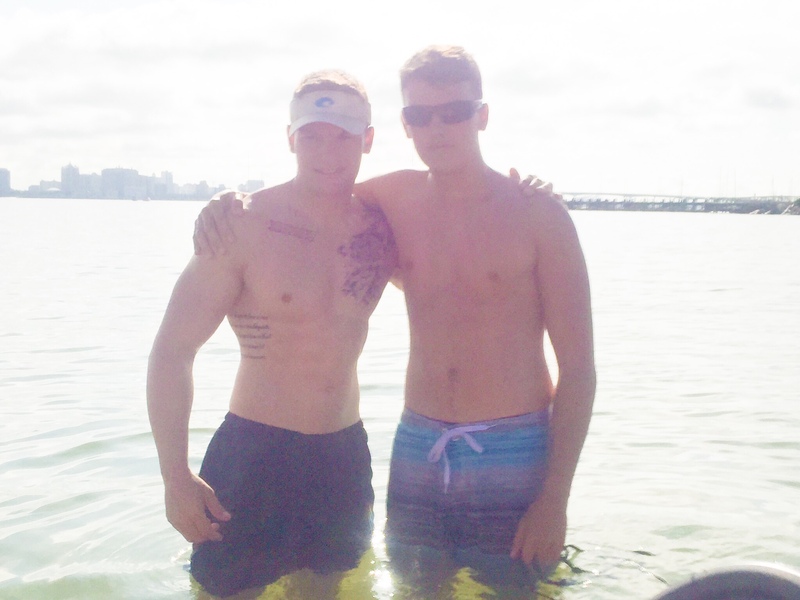 Still, an amazing day and a great friendship was formed. If it wasn’t for Dan, I think we would never have found any fish! 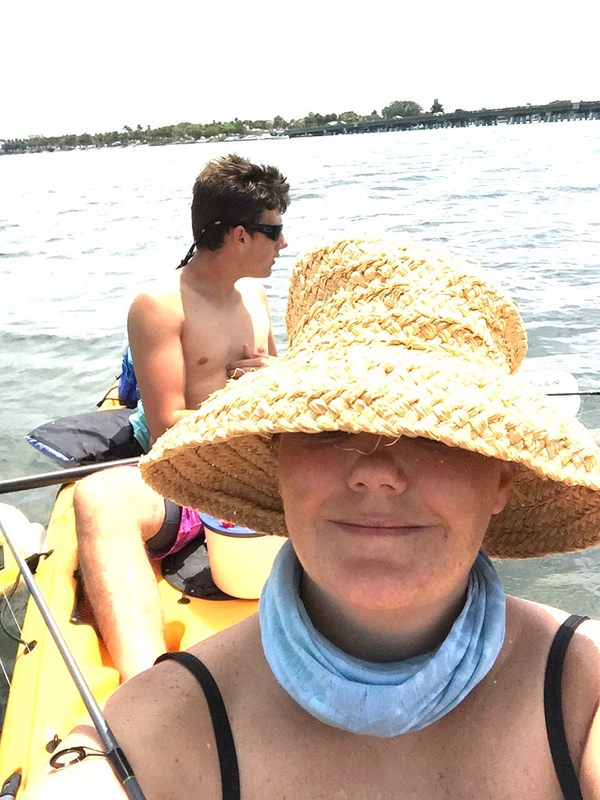 Two months into the tournament, we have become decent fisherman, mostly out of the kayaks and if no luck, we stop at the pier on the way home to cast under the pier and catch mangroves so we feel we caught something. The guys at Hart’s Landing Bait shop, said I bought more bait then anyone other than fishing guides…we were there A LOT!!! Bronson caught a redfish from under the pier one day, I was helping bring it up, the line broke…he will never let me forget that…I am putting it in writing just in case he forgets that he will never let me forget it 😉 We are fishing about 4-5 times a week, still no new redfish, but we are mastering seatrout, so we have entrees for the open division, so not all is lost. People are catching tagged redfish right & left, but they were never registered for the tournament, so they don’t win anything, all 5 boats were still up for anyone to win! 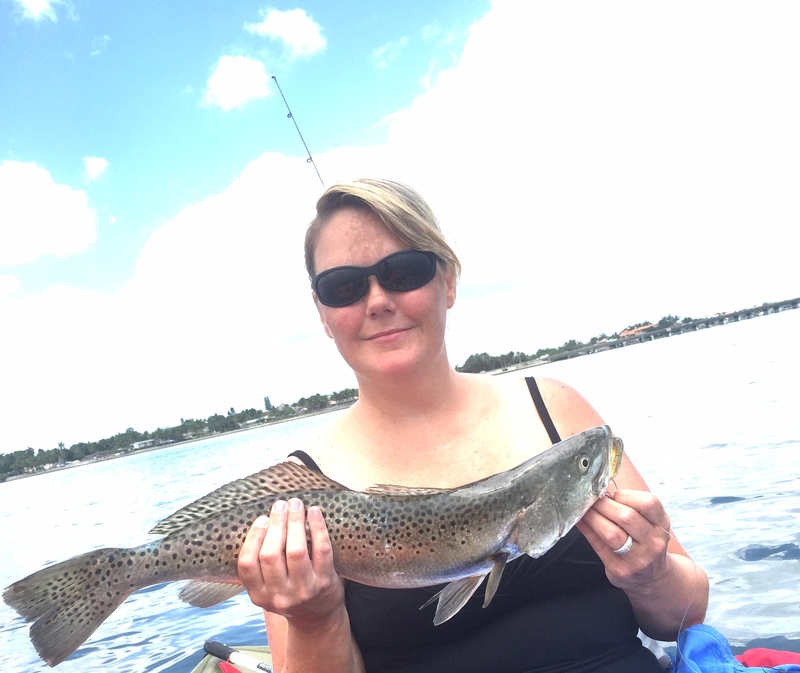 A friend from High school Tami Doutrich had posted a photo of a redfish that she had caught and after asking a few questions…we had a new spot to fish, said to be loaded with redfish! When you don’t know where to find a certain type of fish, everyone will tell you where and how they catch them and 99% of the time, it doesn’t work. I say this, because we chased unicorns for 2 months before we went to the spot Tami told us to go to. She was an angel sent to rescue me from going insane! The first day we went, Bronson caught almost 20 redfish, though all under 14 inches, we were excited, because they were really there! 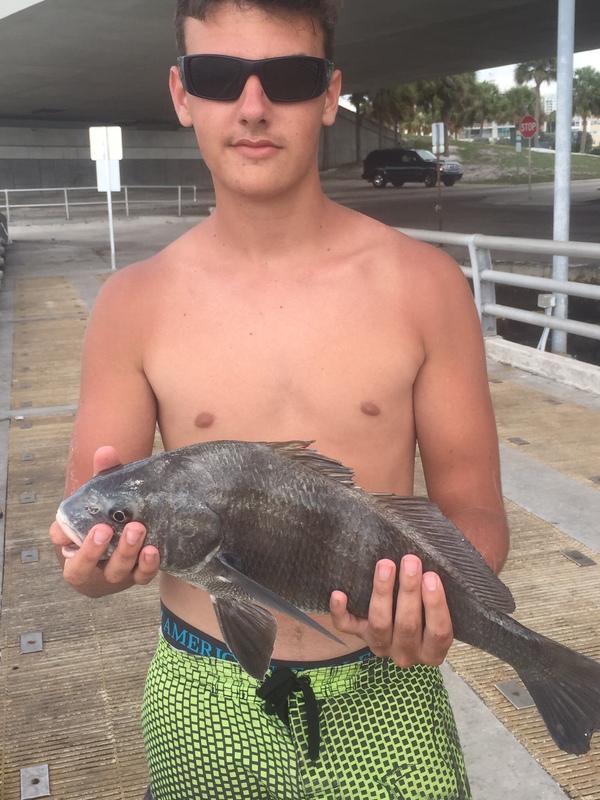 I caught a sheepshead that first day and we realized this was where we needed to fish for the last month of the tournament and we did almost every day for the last month! 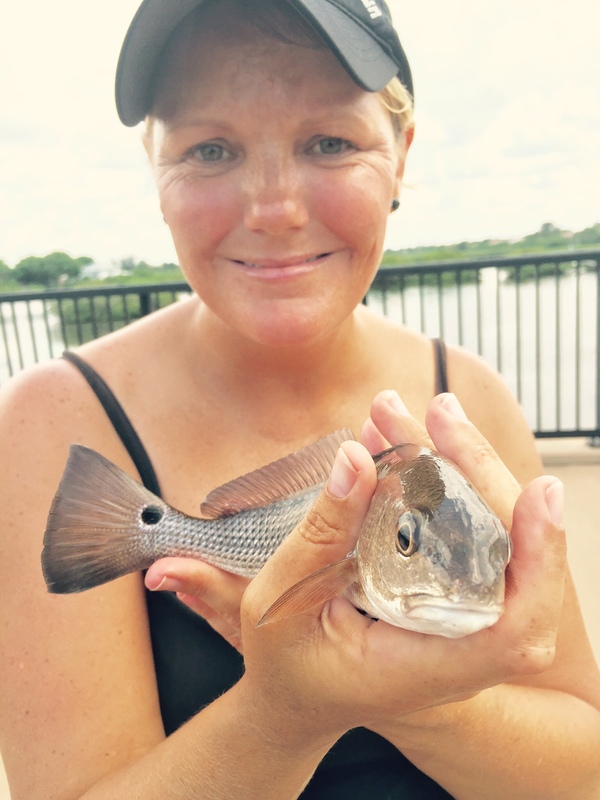 Tami sent me a message on Facebook one morning and told me her brother had caught one of the tagged redfish in the place we were now fishing that morning and released it. 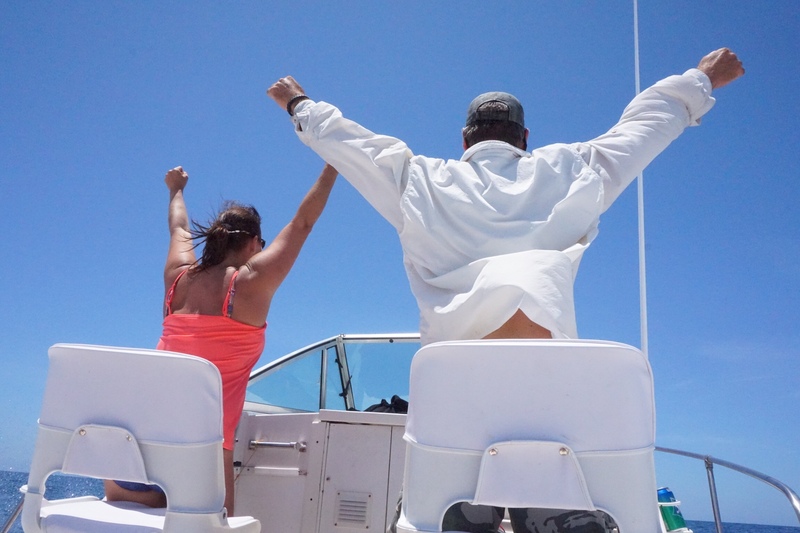 We were fishing in the right spot and now we were even more determined to catch a tagged redfish that would win us a $60,000 boat, motor and trailer!!! We fished in the rain, we fished in the heat, standing up the entire time, battling oysters, a huge population of mangrove snappers and we caught a lot of fish! 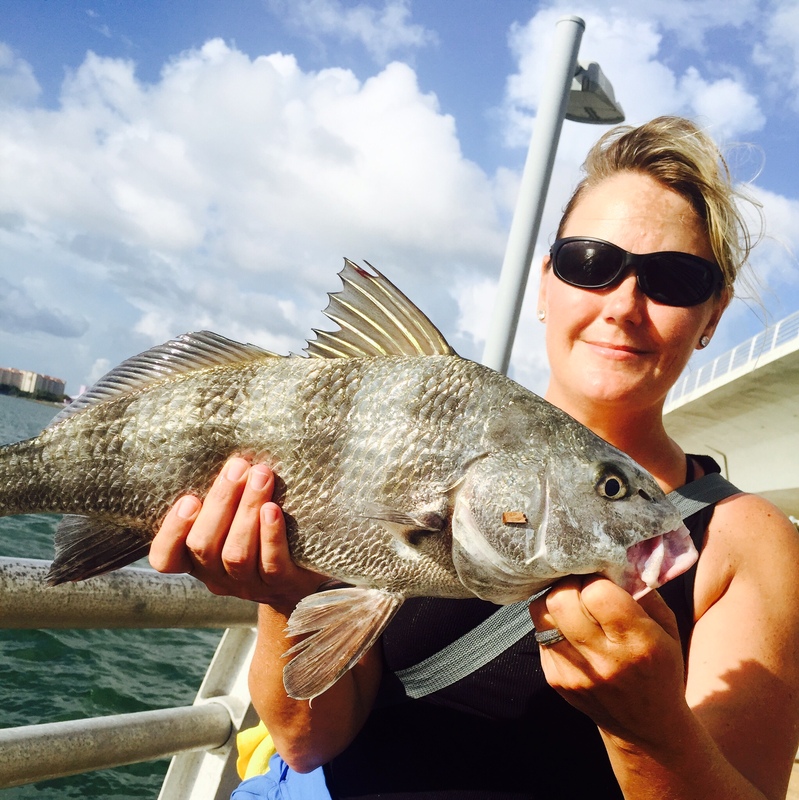 We mastered sheepshead! 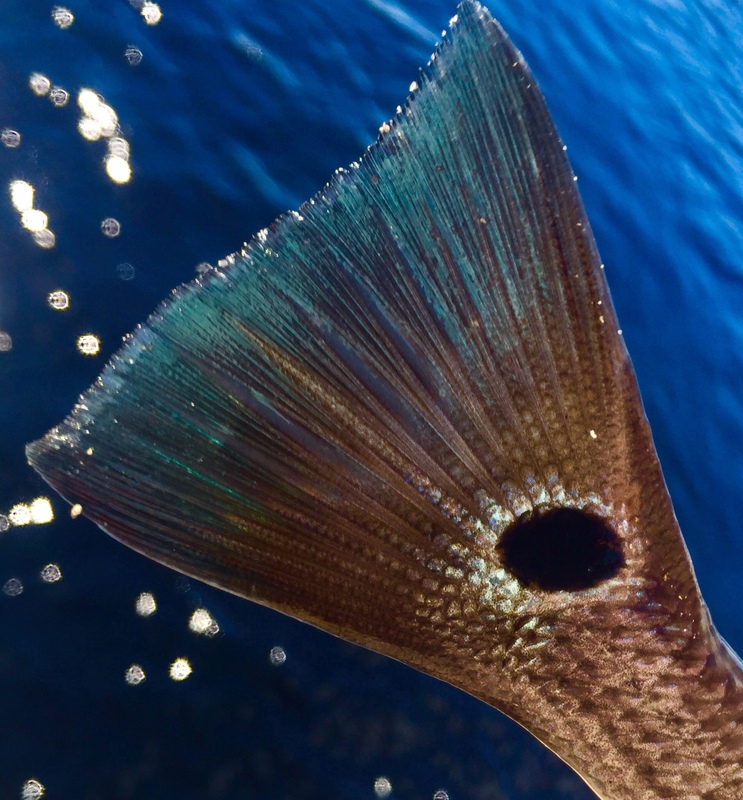 I caught over 7 keepers in one day and I made it my goal each day to catch one to log and then try for the redfish. I caught a huge redfish, over 30 inches one day, had to have the park attendant help me bring it up, but my line broke 4 feet out of the water. It didn’t have a tag, so no big deal, but wow, what a fish! The last day of the tournament, sister Beth’s boyfriend Jeff Weber, offered to take us on his boat with a friend who catches a lot of redfish.My sister wanted us to win the tournament too, so her and her boyfriend came back from their stay in Miami a day earlier, just to take us out on his boat! We are still blown away by their selflessness! 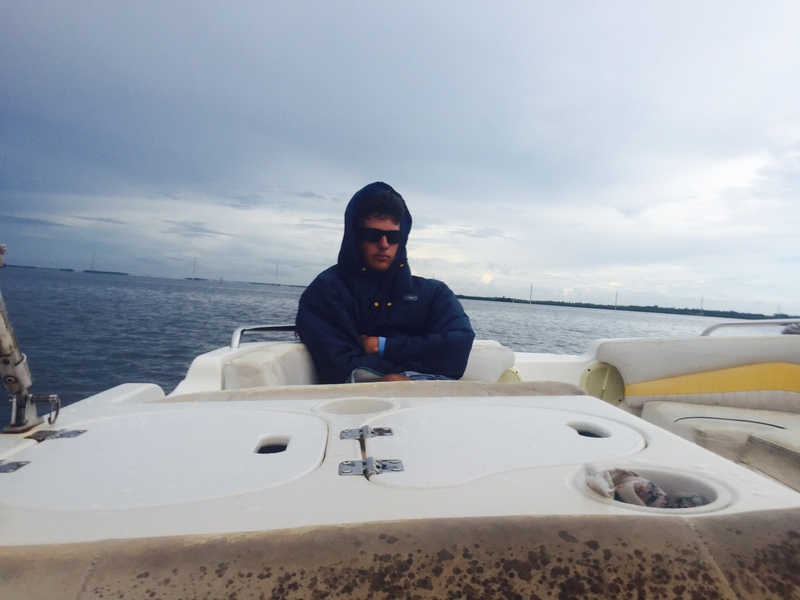 Still wanting to win a boat…we drove down to Cape Coral went out into the storm on Labor Day, fished for hours, dodged thunderstorms, chased tarpon in the marina at dusk, but no tagged redfish. Bronson did catch a beautiful redfish and lost a 40+ inch redfish, and I caught a huge catfish! We did everything we could have, we went from no knowledge of fishing to being pretty good fishermen! I spent hours alone fishing, praying, singing, yelling and crying to God! I wanted a boat so bad, in the end, there were days where I fished 6 hours, came home and then went back out another 4-5 hours, it had become my job to fish! I was exhausted! I was so upset that I didn’t win a boat by catching a tagged redfish!I know that God isn’t Santa Claus or a magic genie that grants wishes, but I know that if you put in the work, that you will be rewarded. On the ride back in the boat on Labor Day, after the storms had cleared and all was calm, I noticed so was I. I had time to reflect on these past 3 months and I’ve come so far. I have battled my fears, I have fought for time with my boys making memories that will last forever and I have found a new life so far from the one before my surgery. 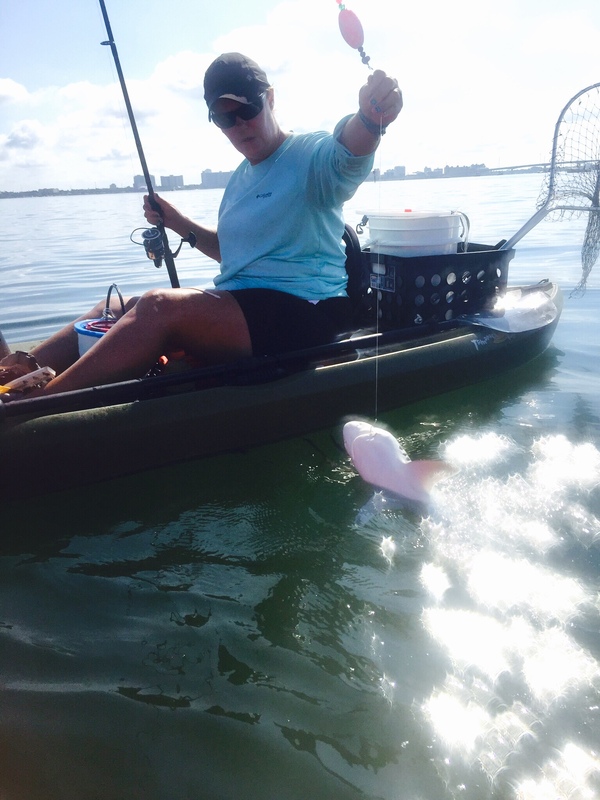 In 3 months, we learned how to fish, and fish from kayaks, while in a tournament! I have found my love for fishing and want to do this professionally one day! I see many more tournaments in the future! I am so grateful for the people who have so selflessly offered there knowledge, their secret spots, their time, their money and their hearts! My husband is the most understanding and amazing man and he became a fisherman’s widow for the last 3 months. He let us fish, encouraged us to fish and cheered us on! None of this could have happened without him. He worked hard while I went off to fish every day. I am so appreciative for his sacrifices to allow us to live this dream! My faith in God carried me when I was ready to give up, His love carried me and He renewed my spirit every day that ended without a tagged redfish.He is faithful…it’s always His way and His timing, but in the end…He still gave me a boat 🙂 Bronson won a $5,000 college scholarship and I won a boat!!! I promised if I did win a boat that I would use it to help other women, kids and families to learn to fall in love with fishing, with the outdoors and make memories! I want to help others to learn to fish, so they can enter amazing tournaments like this one and win things that will change their live! Even if they don’t win…they will make memories that cannot be made in front of the tv or on the couch with your phone in your hand! I don’t know everything about fishing, I’m a long way from that, but I know enough to be dangerous…to the fish! I’d love to help anyone who wants to learn to fish, maybe catch some, but mostly have some fun and not be judged by if you are afraid to touch a shrimp or a slimy fish! This is where the story ends, but our new journey is just beginning 🙂 By the way, I don’t know how to operate a boat or have a place to keep one, so give me a few days to figure it all out and then let’s go make some memories! Tight lines and God bless!! Previous Post How did I get here and why did it take so long to find myself? !